Hydroxyproline is a nonessential amino acid which, as its name suggests, is a hydroxylation of an amino acid, specifically proline, from which it derives. Its greatest concentration lies at bones, on the walls of plant cells and connective tissue, specifically in the collagen. Hydroxyproline is necessary to synthesize collagen, both in bone and skin tissue. Collagen is responsible for the elasticity, beauty and firmness of skin. Its main function is to be the first defense against external attacks from microorganisms, through a skin in good condition. Hydroxyproline is used as a marker in urine tests, in order to evaluate the bone mineral loss. Consumption is contraindicated in the days before when are going to perform a urine test, not to alter the results. 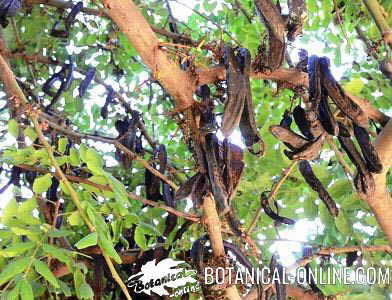 Photo of carob beans: the seeds of the carob tree (Ceratonia siliqua), used as a substitute for cocoa, are one of the richest plant in hydroxyproline, although the most important sources of this amino acid are animal proteins. Although you can take supplements of hydroxiproline, it is recommended to meet the needs of this amino acid through a balanced diet. If supplementation is necessary, consult with the specialist before taking it.